The stairway at the Broadway and Lafayette St. subway station in Manhattan. One of the things I had a chance to do in my free time while in Manhattan this week was visit the David Bowie Is Here display at the Broadway & Lafayette Metro station. The display was inspired by the David Bowie Is exhibition at the Brooklyn Museum. For years Bowie lived in the neighborhood near the Lafayette St. train station. 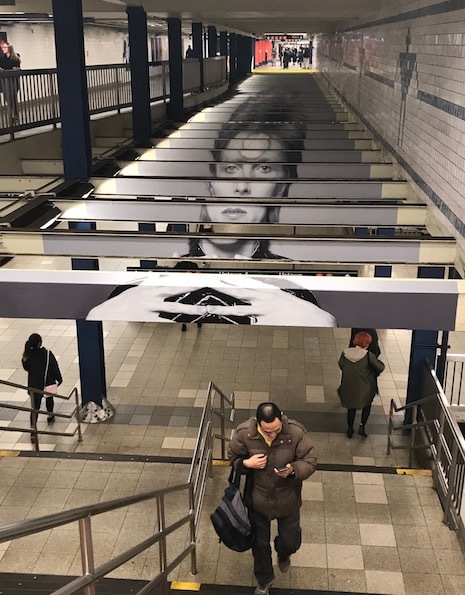 Throughout the subway station were photos of Bowie, writings and other images from throughout his career slapped onto the subway-tile walls. The most stunning is the one above, which forms a different photo of Bowie when viewed from the other side of the stairway. As part of the exhibit, which was presented by Spotify, special David Bowie Metro cards were printed and sold. I picked up four of the series of five (the fifth was sold out). Very cool. Anyway, I’m back in time for the weekend. And here’s what’s happening. 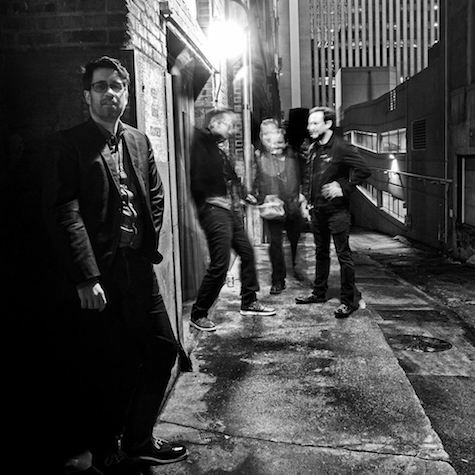 Tonight at The Brothers Lounge Boston noise rock band Karl Marks headlines. The band’s latest, Universal Care (2018, Exploding in Sound), has received nods from the likes of Paste and NPR. Don’t be fooled. This is heavy stuff. Hussies and Chalant open at 10 p.m. $5. Also tonight (Friday) Bokr Tov plays at The Barley Street Tavern with Odd Harmona, Ojai and Scott Severin. $5, 9 p.m.
Over at The Waiting Room Matt Cox celebrates the release of his new album, High Places. Opening are Dustin Arbuckle & The Damnations and Rex Granite Band featuring Sarah Benck. $10, 8 p.m. Tomorrow night it’s back to The Brothers for a very special performance by Lavender Country, the first openly gay country band whose self-titled collection released in 1973 has lived on in rerelease. Frontman Patrick Haggerty has been featured on NPR and in the following documentary, which will take only 15 minutes to watch but will make you want to swing by The Brother Saturday night and see Haggerty live. $7, 10 p.m.
Also Saturday night, The Twilight Hours, which includes Matt Wilson and John Munson of Trip Shakespeare, are headlining at Reverb Lounge. Daniel Christian opens at 9 p.m. $12 Adv/$15 DOS. Last but not least, Matt Whipkey Band is playing a free set of music out at Growler USA. 9 p.m. The Broke Loose celebrate the release of their new EP tonight at Reverb Lounge. Omaha band The Broke Loose’s new EP, Who Are You Wearing? (2016, self release), is a collection of ’90s-flavored indie rock powered by the dual-guitar attack of Matt Evans (Kris Lager Band) and Glenn Antonucci (Dego Red). Frontman Antonucci’s nasal vocals, along with the album’s ever-present pop riffs, remind me of ’90s jewels Too Much Joy, or upbeat Soul Asylum and Goo Goo Dolls. And while the record was produced by Grammy nominated producer Ken Coomer (ex-Uncle Tupelo/Wilco) there’s nary a twang to be heard on the EP’s five tracks. That said, the band references Son Volt and Wilco on its one sheet along with Replacements and Husker Du and Tom Petty and Springsteen — a broad spectrum. The four-piece is rounded out by the white-knuckled rhythm section of bassist Corey Randone (Jimmy Skaffa) and legendary Omaha punk drummer Tim Cox (RAF). It’s always good to have at least one legend in the band, right? It’s good stuff, though they’re not exactly blazing a new trail in the rock wilderness, but who is these days? If you’re looking for solid, straight-up, guitar-fueled power-pop, you’d be hard-pressed to find better in these parts. Find out for yourself tonight when The Broke Loose celebrates its EP release at Reverb Lounge with Anthems and Edison & the Elephant. $5, 9 p.m.
What else is happening this pre-Halloween weekend? Well, PWR BTTM, a self-described queer punk duo originally from upstate New York, now in Brooklyn, are headlining at Milk Run. They released their debut, Ugly Cherries, on Father/Daughter, but they’re headed to Polyvinyl for the follow-up, which should be out early next year. Joining them tonight are Bellows (Double Double Whammy) and Lisa Prank (Father/Daughter), as well as Jade Lacy. $10, 9 p.m. Meanwhile, over at fabulous O’Leaver’s, there’s a Halloween-themed show featuring Des Moines heavy metal act Druids, instrumental synth-horror act Night Stories, our very own Haunted Gauntlet doing “art synced visuals to original and horror soundtrack beats ranging from hip hop to full on punk surf,” and Stephen Nichols doing “video game dungeon horror bass guitar visuals.” They’re calling the event Spew II. $5, 9:30 p.m.
It’s back to O’Leaver’s tomorrow night (Saturday) for the return of Laura Burhenn of The Mynabirds. Burhenn just released a couple solo tracks from what I assume (hope) is an upcoming album. Joining her is Anna McClellan and Annie Dilocker. $7, 9:30 p.m.
Also Saturday night, The Brothers Lounge is hosting its annual Halloween Bash. Lude Boys (Social Distortion tribute) and No Thanks perform. $5, 10 p.m. Finally Sunday night Beach Slang returns to Omaha, this time to Reverb Lounge. Their latest album has been compared to The Replacements, but I think it’s much harder than that — definitely a next-level recording. Opening is Bleached, who I wrote about yesterday, and HUNNY. $16, 8 p.m.
ADDENDUM: Someone pointed out that I missed that Screaming Females show at Milk Run Sunday night — a yuge show. With Moor Mother and Bien Fag. $15, 9 p.m.